This is my favourite page. The colour is a little off - I really really am going to find a scanner soon, I promise. I based this off a William Morris design, though I simplified it a little because I wasn't going to sketch every little frilly bit. I not only like the shape of this the best, but I also like the way the writing looks on this one better than the other pages. This is a lovely sketch. 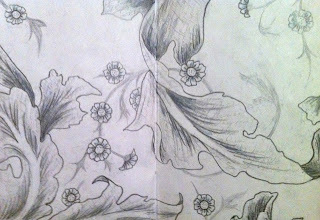 I'm also a William Morris fan (I've been making Wedding Guest books, with Liberty prints, bearing classic Morris designs). 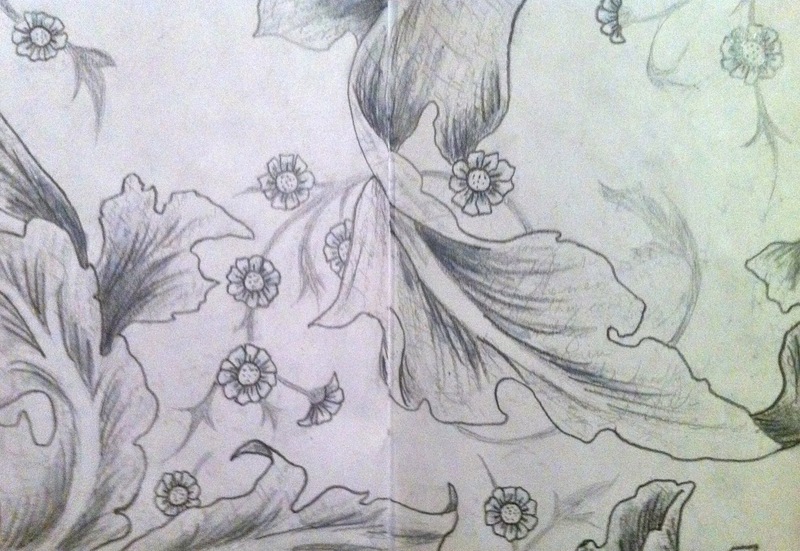 I like this pattern/design very much and somehow the monochrome of your sketch really brings out the clarity and beauty of the design itself. It also reminds me of those lovely Florentine papers, which many bookbinders like to use. I have some of those too - I think I'll go and look at the fabrics and papers together now - I may make some more "discoveries"! Thanks for sharing your lovely sketch. By the way, just to tell you that the wonderful Bookshelf lino reduction arrived, just the day before I went off to Spain (to do my own linocuts!). I left it under boards, flattening out and "rediscovered" it this afternoon, while tidying up the studio. It is lovely - thank you so very much, Jennifer - it will have pride of place on my Art Wall! Oh terrific! I didn't think it would have gotten there already. I was going to ask if it survived the journey - I had not idea how to package it. I've been thinking about making another version of this design, actually, as a fabric design and putting it up on Spoonflower.